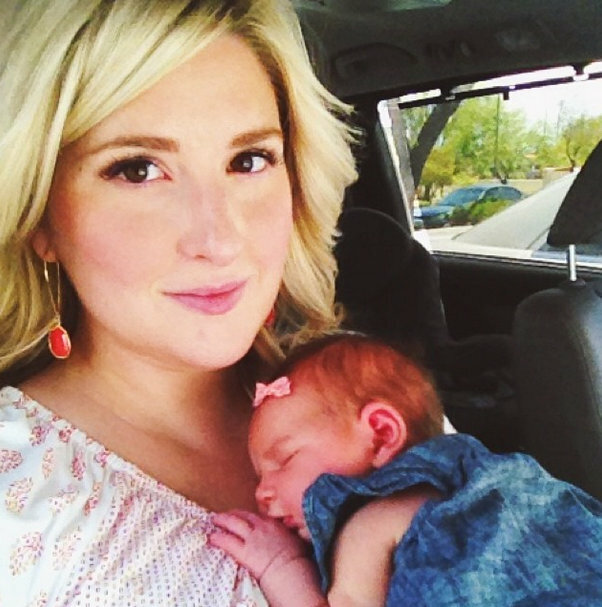 I took this selfie after nursing Louisa in the car outside of REI when she was just a week old. She was so bitsy and I was on a huge high from giving birth and finally having this sweet baby girl, safe and sound. I felt so pretty and good in this picture. Two months later we moved to Seattle and I lost it. Depression and anxiety took over. I gained a lot of weight. I was a hot mess. The last year has been one giant yoga move that I can't pronounce or practice correctly. Maybe that metaphor only makes sense in my head, but my body can't move the way it used to because I'm now in my 30s and haven't taken good care of myself. My brain has been through the wringer between bouts of mental illness, feelings of inadequacy, spiritual discovery and general self-reflection and growth. I feel like I'm growing up and growing into myself more than ever. For those of you who have been my internet friends for years, I think you've seen a lot of this in these pages of my life and I'm grateful for the e-mails, comments and love. - Self care is important. No. Vital. I am still figuring out what that means for me on a personal level and how to practice it every day, in small ways. - The scale doesn't matter. What I eat and my activity level does. Not because I should feel shame for eating all the cookies but because it impacts the way that my body is able to function. Staying up late, not drinking enough water, and eating my feelings are all common issues for many of us and they directly impact the way that I am able to be a good human. - Authenticity = happiness. People that will not accept you for who you really are, what you really think, and who you really want to be aren't your friends. Authenticity is stretching. It hurts. It's terrible and terrific in one. Forgiving people who don't love your authentic self is also really stretching, hurts and is terrible and terrific. - I'm OK. You're OK. We're all OK. And if you need a pep talk, check out the Pep Talk Generator. We got this! This is why I love your blog. Thank you for your honesty!! And amen on self-care. Some mornings I feel guilty for sneaking out of my house at 5 am and letting my husband handle breakfast for all the kids...but those pre-dawn hours alone running are what stave off crippling depression, and that is 100% worth it. Thanks Rachael! I am trying to be a runner but my stupid knees and ankles are not my friend. Can't wait for the weather to warm up a little so I can start jogging again. I definitely need to be better at getting in more exercise! The best blogs are the honest blogs. I just joined the YMCA and went last night for the "get started" session. My plan is to do weights twice a week. I want to get strong. And I started the Matt Damon Diet (don't bother googling it -- I made it up!). He is the commencement speaker at MIT (where I work) and I've given up soda and desserts and hope to get in shape in case he wants to hang out with me after his speech. hahahahaha! You made me LOL. Haha! Matt Damon is the best! I just think you are fabulous. I originally came for the recipes, but I LOVE the authenticity. It's so refreshing! These posts always make me stop and think. i always enjoy your blog and appreciate your honesty. Wish we could be friends in real life. :). Take care of you and thank you for your words. Great post! Our move up here was brutal for me too. Lots of loneliness and figuring myself out. I've learned so much about the importance of self care this last year. It's a necessity. Not only do I need it, but my family needs me to do it. When I can take some time out for me I'm a better wife and mother. Check out the book, Fringe Hours. Lots of great stuff in there about the balance of being a mom! This your internet friend in LA saying hi. Thank you for being courageous to talk about the tough things in life. I too am trying to balance many of the things you spoke of and by gosh, it's hard! Keep fighting the good fight because you are worthy! Thanks Laura! You are worthy too!